Greetings! Thanks for joining us for the 10th year of the Out on a Limb CSA! As we pat ourselves on the back for getting this far as a CSA, we would do well to remember that 10 years is really just a blip in time from the perspective of the apples we’re showcasing. Each of the select few “modern” varieties we offer had spent at least 10 years (usually much longer) under the critical eyes of orchardists, before they were made public. A 10-year-old apple tree is really like a toddler just learning to walk. To the many heirloom varieties we feature, a decade is just a drop in the bucket, because they’ve been in cultivation for over 100 years, and in some cases, well over 300 years. And 10 years is really minuscule compared to the many thousands of years humans have been eating and selecting apples for desirable traits. But enough talk of the past; the present season is flying by—let’s enjoy it while it lasts! That’s what you signed up for, and we’re excited to bring you along for the ride for the next 10 weeks. For those of you who are joining us for the first time, Welcome! If you haven’t met us before, you can learn more about us here, or you can find us tabling or speaking at one of our apple-related events (which will be posted both here in the newsletter and on our Events page) and come introduce yourself! -An introduction to/ summary of the week’s share. -A list of the variety names. Be sure to click each variety name to read about its history, characteristics, and best ways to enjoy it. -A recipe of the week, featuring at least one of the varieties in the week’s share. The newsletters are intended to educate, entertain, and inspire extraordinary apple experiences. We hope you read them and make use of them throughout the season. Please be in touch with any apple-related questions, stories, observations, and–of course–recipes to share! The early apples announce their arrival by carpeting the ground beneath the trees. And after this hot, dry summer the fruit started dropping earlier than ever. We were busy harvesting August tomatoes when we looked up to see that our Red Astrachan and Pomme d’Or limbs were bare. We were too late to enjoy these summer varieties. Luckily, we got our ladders and picking baskets ready in time to catch the next wave of early apples so that we can share them with you. We think of most early apples as cooking apples as they tend to be tarter and not as crisp as most good eating apples. Cook Duchess, St. Lawrence and Milton into a pie or sauce to get yourself into a fall frame of mind. Duchess, an old Russian variety, is the reigning queen of early pie apples. Just ask anyone from Aroostook County where the old timers call this apple “Dutch”. (This practice mystified us until we understood that multiple Dutch trees were Dutches or Duchess.) Duchess is one of the few apple varieties that come relatively true to type from seed. Hence there are many Duchess lookalikes out there. The ones in your bag this week have a bloom on them, that frosty looking covering on the skin that you also find on grapes. That is something we don’t usually find on Duchess. St. Lawrence and Milton may not be as much of a stand out for pies as Duchess, but they do take the prize for spectacular looking apples. No other apple quite exemplifies the term “stripey” as well as St. Lawrence. And the pink and yellow Milton comes in a potpourri of colors, shapes, lip-iness and sizes that amazed us and kept us laughing as we were packing the bags. No wonder it is so challenging to identify apple varieties. In order to satisfy those of you who like your apples fresh, we had to turn to some of the more modern breeding programs to come up with unusual, early fall dessert fruit. Zestar is one we have offered many times, but this year it has a new twist. The European Apple Sawfly has left its mark on the skin with quite impressive results. We were able to spell “sawfly” with some of its handiwork. See what amazing designs you find, and send us a picture. The insect artwork will not affect the flavor or quality of the apple. Chestnut is the apple we are most excited to offer this week. Just the right size for a school lunch box or a quick snack at your desk, this little crab packs a flavor punch that has made it a perennial winner at the Common Ground Fair apple tasting. Williams’ Pride is a first timer in the CSA this year. They are hard to come by and we don’t have many, but we wanted to offer you a taste of something new. Emily wondered if this apple was named after Serena. St. Lawrence in all its striped glory. Calligraphy courtesy of European Apple Sawfly. Guess which one is Milton? …They all are! 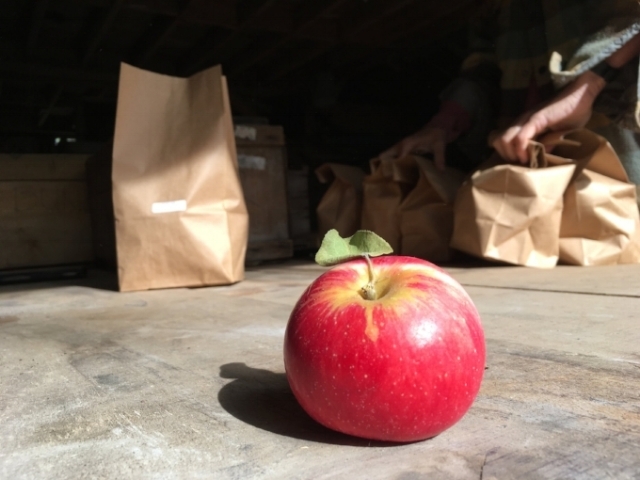 Longtime CSA member Cheryl Wixson is hosting a cider pressing and sparkling cider tasting at her farm on Deer Isle for all interested apple lovers. Find more details here and read more about the annual Maine Open Winery Day here. The annual Common Ground Fair is coming up on September 21-23. As always, some combination of us will be hanging around the Fedco Trees/ Maine Heritage Orchard booth. John (with the help of Cammy and Laura) will be assembling a vast display of apple varieties found in old Maine orchards, so stop on by and say hello. Several people will be on hand to help identify mystery apples. There will be plenty of interesting farm and orchard talks in the Hayloft Tent, and of course the apple tastings on Friday and Saturday are always a blast. Come cheer for your favorites! With 8-9 pounds of cooking apples in your bags this week, we hope your kitchens will soon be filled with the intoxicating smells of fall. There is plenty to experiment with so we are including two recipes, a sweet one and a savory one, to inspire you. I’m not very good at following recipes, and I rarely have all the right ingredients, so the recipes we offer you are my adaptations and simplifications of recipes I’ve read. I encourage you to read between the lines, add the spices, fruits and vegetables you have on hand, and make these fit your taste buds and larder. In a saucepan, combine the vinegar, cider, sugar, ginger, salt and pepper over high heat. Bring to boil. Add the onion and mustard seeds. Lower the heat to medium, and cook until the onion is soft and translucent and the liquid is reduced by half – 10-15 minutes. Add the apples, and cook another 15-20 minutes until the mixture become soft and spreadable. Add more cider if it becomes too dry as it cooks to prevent burning. Remove from the heat. Serve either warm or at room temperature. The Mostarda can be served over pork loin. As an appetizer it pairs well with an aged Gouda or semifirm cow’s milk cheese on a crostini or cracker. Preheat oven to 350 degrees. Grease a 9”x13” baking dish with coconut oil. Place apples and blueberries in the greased baking dish. In a mixing bowl combine the almond meal, oats, sugar, salt and spices. Add the melted coconut oil and vanilla, and mix until just combined. Crumble this topping evenly over the fruit. Bake 45-55 minutes until the fruit is soft and bubbly and the top is beginning to brown. Serve warm with ice cream or yogurt. Also good leftover for breakfast.